3000+ General Knowledge Quiz Questions and Answers for GK Quiz competition exams, game shows, Current Affairs for UPSC Civil Services, Bank PO/Clerical, MBA, NDA, Railway Exams and All GK Competitive Exams. A quiz is a form of game or mind sport in which the players (as individuals or in teams) attempt to answer questions correctly. Quizzes are also brief assessments used in education and similar fields to measure growth in knowledge, abilities, and/or skills. 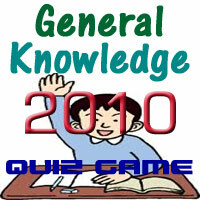 GK Categories are World Geography, Geography of India, History of India, Indian National Movement, General Science , General Awareness, Economics, Current Affairs, Games and Sports, Chemistry , Political Science, Science & Technology , Art & Culture , Art & Culture , Commerce & Industries, Indian Constitution , Physics , Biology , Agriculture , Computer Questions and many more.